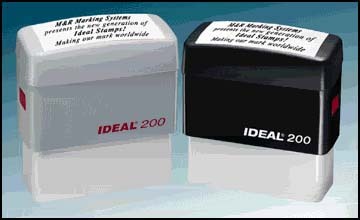 Permanent Markers - DecoColor Paint Markers for Metal, Glass Marker, Leather Etc. Unique Paint Markers ideal for graphic artists, hobbyists and shops who require an easy way to draw on surfaces. 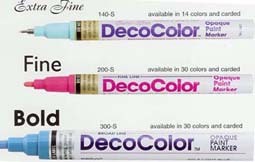 DecoColor paint marker is weatherproof and comes in extra fine tip, fine tip, bold tip, calligraphy style tips. Colors, Opaque White, Liquid Gold, Liquid Silver, Glitter paint, and Calligrapy paint markers. CAUTION: Contains Xylene. Keep out of reach of children. Not recommended and unsuitable for certain types of plastics, leather, metals, finished wood, paper and fabric products. Always test on a small inconspicuous area first for suitability and chemical reaction. Results may vary, depending upon surface and climactic conditions and/or chemical composition of product being tested on. You only need to check out once. That's One Stop Shopping at the Square! Paint Permanent Marker, most surfaces including glass, metal, porcelain, plastic, stone, wood and leather ETC. Color will remove or blend with ordinary turpentine. 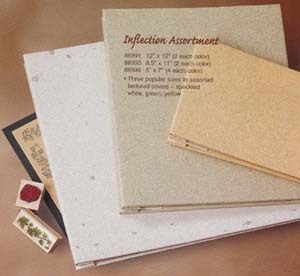 Copyright 1999-2011 Shop For Supplies, Inc. All rights reserved.